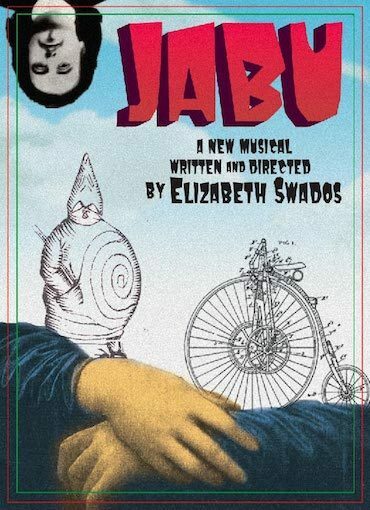 The Flea Theater presents Tony Nominee Elizabeth Swados’ JABU, a musical comedy that combines the French Absurdist classic play Ubu Roi with the wild life of young playwright Alfred Jarry. Written, directed, and composed by Swados and starring The Bats, the resident acting company of The Flea, JABU begins previews February 16th with opening night set for February 26th. In JABU, scatological Pa Ubu and his bumbling cronies murder the King and throw the country into mindless chaos. This is juxtaposed against the colorful life of Ubu playwright Alfred Jarry, a vibrant young man determined to be his own comic star. While dimwitted Pa Ubu tries to maintain his wealth and position, Jarry befriends such luminaries of the day as Henry Rousseau and Madame de Rachilde while attempting to get famed director/producer Lugne Poe to produce his play about Ubu. JABU is staged using elements of vaudeville, circus, puppetry, clowning, and musical theater mixed with slides and video. It features a cast of 18 including: Nicola Barber, Stephanie Braun, Paula Ehrenberg, Michael Francis, Meredith Holzman, Parrish Hurley, Nicholas Job, Derrick Karg, Jamie King, Danielle Levanas, Taylor Mac, Emily Mattheson, Kevin T. Moore, Ana Valle, John Pizzolato, Hondo Weiss-Richmond, Matt Wells,and Matt Wilson. the production also features set, puppet, and video design by Sue Rees; costumes by Melissa Schlactmeyer; lighting by Garin Marschall; and musical direction by Kris Kukul. Elizabeth Swados has been nominated for five Tony Awards as well as Drama Desk, Ace and Emmy Awards. She is the recipient of three Obie Awards, an Outer Critics Circle Award, a PEN Citation, and an Anne Frank National Foundation for Jewish Culture Award. Her Broadway credits include Runaways and Doonsbury. Her off-Broadway credits include Alice in Concert (with Meryl Streep), Dispatches, The Haggedah, Jerusalem, Rap Master Ronnie (with Gary Trudeau) and Missionaries. Her works have been seen at The Public Theater, Manhattan Theater Club, BAM, La Mama, Lincoln Center, Mark Taper Forum, among others. She is currently working on a handful of new musicals: The Three Gods, Kaspar Hauser, Jewish Girlz and another based on the book of Judith. JABU was developed at the Alley Theater where it is slated to premiere.